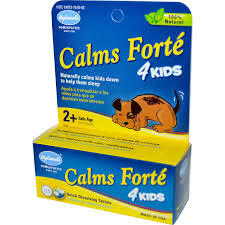 Treats: temporarily relieves the symptoms of restlessness, sleeplessness, nightmares, joint pain, causeless crying, occasional sleeplessness due to travel and lack of focus in children. The model for homeopathy is one of individualization, as no 2 people are alike. It takes an holistic approach to healing, involving the body, mind, emotions, and spirit of those being treated. Many childhood ailments are very effectively and quickly treated with homeopathy without producing any side effects whatsoever. Unlike antibiotics and other such medicines, homeopathic pills do not hamper digestion, or lower the body's resistance. Neither do they cause any allergies nor cause any damage, even if taken over a long period. There is no toxicity, no addiction, no dependency, no withdrawal, and are sage even for infants. Children ages 2 - 5: Dissolve 2 tablets under tongue every 15 minutes for up to 8 doses until relieved; then every 4 hours as required. Children ages 6 - 11: Dissolve 3 tablets under tongue every 15 minutes for up to 8 doses until relieved; then every 4 hours as required. Children 12 years and over: Dissolve 4 tablets under tongue every 15 minutes for up to 8 doses until relieved; then every 4 hours as required or as recommended by a health care professional.